My neighbor has a standard fishing-type Feather Craft, which shows impressively! Feather Craft made very high quality aluminum boats, but I've never seen a second Feather Craft boat—anywhere. 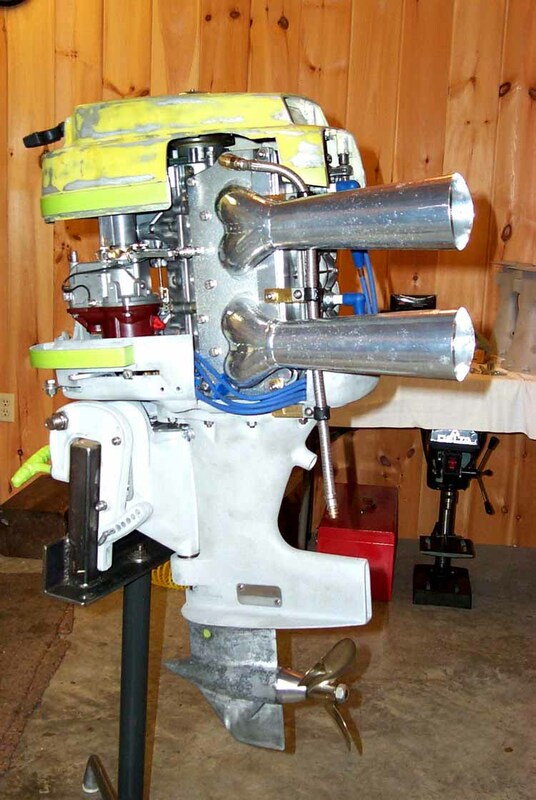 The Mercury 55 is a four-cylinder engine, highly prized among outboard racers. The videographer has the engine specifications mixed up with something else less powerful. Start at minute 1 in the video below for a walk-around of the boat. It's a 1957 55 E (for electric start) (I looked up the serial number on the auction advertisement) It's a 40 hp motor. The Mercury 55 H is the really sought after version for performance. Mostly for the Quicksilver lower unit that only the H models had. Last spring my son & I picked up a (Mark 58 A) model. Essentially the same motor as the one in the video. As an FYI the number in front of the model name has nothing to do with horsepower. Most of them had in very simple terms pretty much the same engine block back then. On my sons and for all 1959 models that year they had the letter A at the end. The letter A stood for anniversary, for mercury's 25th year anniversary back then. 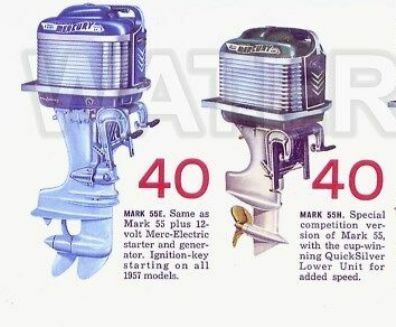 Little know about mercury outboard motors back was they often lied about how much horsepower their motors made. More often than not they gave out more horsepower than what was advertised. It was a brilliant marketing false advertising gimmick that worker in favor of the consumer. Until they got caught. Example: If you had two identical boats with lets say a 25 hp evinrude motor and a 25 hp merc. More often than not the Mercury would go faster. It did a couple of things, first it made the person who had the slower boat consider purchasing a merc the next time they got a boat motor combo. Second the faster boat owner felt like he had a better motor and gave them confidence to re-purchase a Merc the next time they upgraded. Third it was a sneaky way to get around horsepower restrictions that are often found on small lakes and ponds in many places. 1956 modified Mercury 55 H in non factory colors. From the factory, Manual / Pull start, lightweight gimbal bracket and no shocks with racing lower unit. The expansion chambers are an aftermarket accessory. Top-Water - Nice history on the Merc! Thanks. I always wondered why they were faster than the competition. 'Why was the 20 hp Mercury a Mark 25, and the 40 hp Mercury a Mark 55, while the 30 hp job was the Mark 30? It's a 1957 55 E (for electric start) (I looked up the serial number on the auction advertisement) It's a 40 hp motor. The Mercury 55 H is the really sought after version for performance. Mostly for the Quicksilver lower unit that only the H models had. We had a Mercury Mark 25 (20-HP ), but don't know if it was "Peacock Blue" or "Bimini Blue". Our next Mercury was white—before they made all their motors black. "To sell motors, we will leave no stern untoned!" Back to the Feather Craft: Although likely heavier than it's equivalent in wood or fiberglass, the pronounced curves had brought impressive sheet-metal rigidity to boating. Reminds me of the Mercury straight 6 back in the days. It was a formidable engine during the 60 mph marathon races. I believe Goodhue had a Hydrodyne with 2 of them attached! 'It takes Two to do it'. The 'Green Wink' also had two. The Merc 6 was advertised as 130 hp, but rumored to run at 140 hp at the prop. On the market place not to long ago was an Allision and a Magnum Missile, both with the Merc 6. What memories!